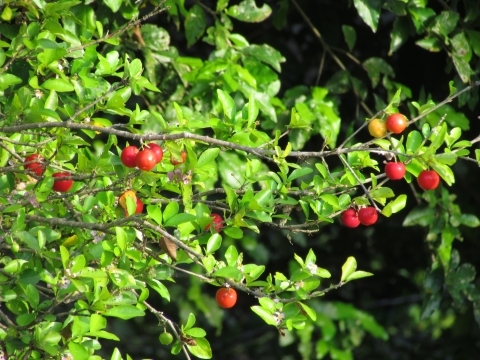 There has been some confusion over the correct name for the Barbados cherry, also known as the Acerola. Current thinking seems to be that there are two closely related species, this one and M. glabra. This species is the genuine Barbados cherry that is cultivated for its fruit in Puerto Rico, whilst B. glabra, also known as Barbados cherry or Escobillo, is not the species cultivated in Puerto Rico. Malpighia urens lanceolata (Griseb.) Griseb. Photograph by: Wilfredo R. Rodríguez H.
Barbados cherry is an evergreen shrub growing around 4 metres tall. ]. It is grown especially in Puerto Rico, from where it is exported in quite large quantities as a health juice to the United States. C. America - Mexico to northern S. America and the Caribbean.